At Impact, we are proud to support our local communities who have given so much to us over the years. We encourage and empower everyone in our organization to give back whether it be through philanthropy, active involvement in local non-profits, or simply volunteering their time and support for a cause. Our mission is to continually strengthen the communities that we serve and build upon the relationships we have fostered over the past 30 years. 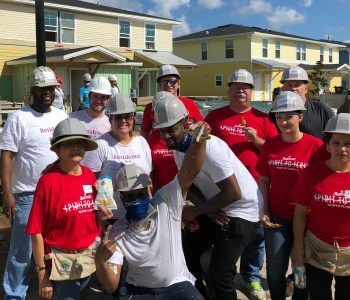 Team members from the Residence Inn by Marriott Jacksonville South Bartram Park volunteered to build and restore housing with Habitat for Humanity in multiple areas of the greater Jacksonville community. Impact Properties was a proud a supporter during the 3rd Annual City of Jacksonville Military Spouse Appreciation Event. Serving our military members is an important part of the Military Affairs and Veterans Department mission, and serving their families is no exception. The Home2 Suites by Hilton Gainesville participates in Clean the World’s Hospitality Recycling Program by donating used goods such as soap bars. The organization’s goal is to recycle used items to provide much-needed hygiene products to those in need in North America and around the world. 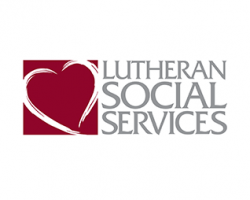 Impact’s Jacksonville office supported the local Lutheran Social Services mission of helping house displaced refugees by donating furniture and household goods to furnishing the residences of the refugees. 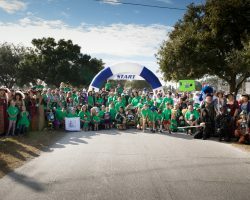 Impact’s Tampa office volunteered and donated to the local Tot Trot event for HRH that helped raise over $65,000 to raise awareness and support families affected by premature birth. 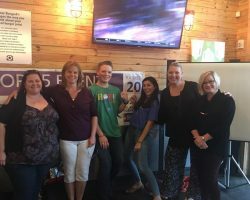 BurgerFi Soho hosted the kickoff event for the South Tampa chapter of the Relay for Life event which strives to remember loved ones lost, honor survivors of all cancers, and helps raise money to help the American Cancer Society make a global impact on cancer. The BurgerFi Soho team participated in the Relay and helped raise donations for the cause. 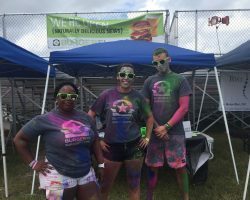 BurgerFi Sarasota participated in the Color Run 5k which helps raise funds for the Just Care More Foundation which is centered around using athletic events to improve the overall mentality and outlook for inner city children. BurgerFi Soho hosted the families of Gorrie Elementary for a spirit night fundraiser. 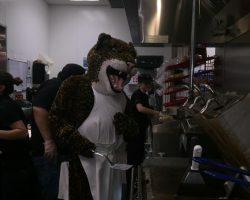 Gorrie’s mascot enjoyed time in the kitchen cooking up tasty burgers for all the patrons! 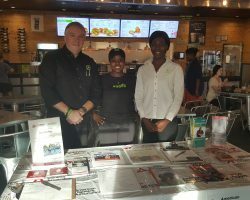 BurgerFi Soho supported the American Diabetes Association by hosting a kick off event to raise funds and awareness for the cause in the local community.